Let me start by talking about who is Jimoh Ibrahim and his biography as well as his significance before i go into the embarrassing manner in which men who are supposed to lead the country's youth have degenerated into. The Nigerian billionaire who was born 24 February 1967 is a lawyer, politician, businessman, and philanthropist in Nigeria.His business interest are scattered all over West Africa. He is CEO of Global Fleet Group.His business interests include oil & gas distribution, hotels, resorts, airlines, banking, real estate, insurance, publishing and investments. University,then known as the University of Ife.His origin is Ondo state,hence the battle with Eyitayo Jegede to become the governor of the state.He graduated with a bachelor of law degree and obtained a Master of Public Administration (MPA), from the same University. He then went to the United states where he also attended Harvard University in Cambridge, Massachusetts, USA, graduating with a combined Master of Laws (LLM) and Masters In International Taxation degree. Jimoh Ibrahim net worth is a staggering $1b! He has also been featured on Forbes many times. Now with all these we know Ibrahim is a well learned man who worked heard and deserves the billions he was to later attain.This is why i am a bit surprised by all the kind of languages being traded with known trouble maker Femi Fani Kayode as a result of the court battle with Eyitayo Jegede. He was the Ondo state gubernatorial candidate of the Peoples Democratic Party (PDP)for the November 26 governorship election in Ondo State.But this was challenged by Jegede and the supreme court finally gave the mantle to the latter,denying the billionaire the chance to govern his state.But why do Nigerian and African politicians think it has to be do or die to govern? If you really had the interest of the masses,you support whoever is going to govern to attain what is best for the people. 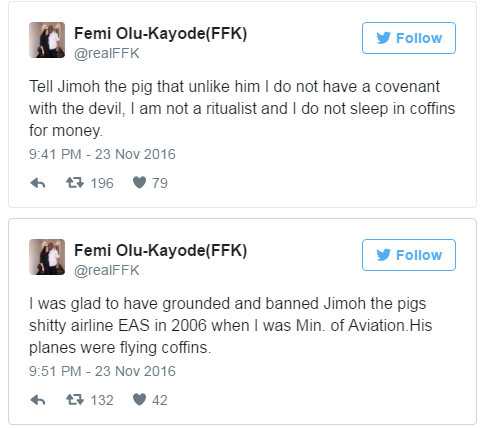 His fight with Fani Kayode goes way back as the then minister of aviation in 2006 grounded his EAS airline.Calling his planes coffins. Their latest engagement on twitter is embarrassing,especially from the former Nigerian aviation minister. You can see some of their exchanges below..
"I would be demystifying myself to be trading words with Femi Fani-Kayode. Someone who will sing & dance makossa for you if you give him food. If you know someone that know Femi Fani-Kayode, help me pass this message to him; "I AM A BILLIONAIRE. I DON'T HAVE A CASE WITH EFCC." I hope the coming generations of Nigerian politicians don't take after these men.This is a very bad representation of what governance in Nigeria has become.